Previously shot in Los Angeles, the championship play-by-play is announced by Van Earl Wright, former CNN anchor and a past host on FSN Final Score. Brian Dunkleman, one of the original co-hosts of American Idol, hosted the 16 episodes in the Sky Ball League series. 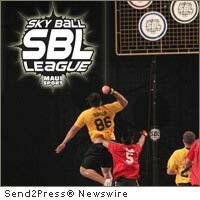 Sky Ball is an extremely competitive and spirited combination of basketball, baseball and volleyball, with a little lacrosse thrown in. The game uses Sky Balls and smash gloves and is played on a court with goals set at each end that consist of three scoring pads raised 12 – 17 feet above the court. Game highlights: http://www.youtube.com/watch?v=9pCD1YXJ9iM . Slightly larger than a softball and pumped with oxygen and helium, Sky Balls are capable of bouncing up to 75 feet. Besides the requisite physical dexterity, the challenge to players is that they must not only excel in controlling the ball, but the skillful manipulation of a challenging piece of equipment. Original Keywords: Brian Kessler, Maui Sport, Skyball, Sky Ball League, SNY.tv, 2011 championship game between the Los Angeles 405s and the Youngstown Ballers Sky Ball League Los Angeles California LOS ANGELES, Calif.
REFERENCES: California Business News, Brian Kessler, Maui Sport, Skyball, Sky Ball League, SNY.tv, 2011 championship game between the Los Angeles 405s and the Youngstown Ballers Sky Ball League Los Angeles California LOS ANGELES, Calif.